Here’s a common scenario for top talent in the tech industry: you love everything about your current job – the team, your manager, the culture, the product – but all of a sudden, seemingly out of nowhere, you find yourself downstream in an interview process with another company. You’re not even sure how you got this far (it all happened so fast!) but here you are, going through the final stages for a new job when you love the one you already have. Then, the offer comes and things get even more difficult. Maybe it’s more money – a lot more. Or maybe it’s a bigger title with more responsibility. Or maybe it’s with a fast-growing unicorn, and you’re interested in getting in on that pre-IPO payday. Either way, you’re in a tough spot with three options in front of you: take the job, turn it down, or negotiate. There’s a lot that needs to be considered before pulling the trigger in any one direction. With that in mind, Paysa is here to help. This post walks you through how to make the right decision for you and your career. You’ll learn how to evaluate and negotiate the offer (both with your current employer and potential new company) while maintaining your integrity and taking the necessary steps to accelerate your career. 1. When it’s your dream job. Maybe one day, you’re sitting at your desk doing your job when all of a sudden, a recruiter from Facebook reaches out about a software developer job in their growing New York City office. You’ve always wanted to live in New York and work for Facebook, so even though you love your current job, you go through the interview process. Turns out, the opportunity is even more delightful than you could’ve imagined. As much as you love what you do now, you know this opportunity is exceedingly better and something you’ve always wanted to do. Well then take the job! Sure, it’ll be hard saying goodbye to your current employer, but you’ll get over it when you’re living the dream in your new gig. Don’t complicate things when it comes to your dream job – provided the offer is reasonable, humbly accept and get excited. Average salary for a developer at Facebook, per Paysa data. 2. When the company has already stretched to meet your needs. Let’s say you currently work for Google as a product manager and a recruiter from a smaller startup contacts you about joining their team. You decide to move forward with the interview process, but remain transparent that you’re happy in your current role and explicitly share what it would take to get you to leave. If you’re excited about the company and they follow-through with meeting your needs, consider accepting the offer. Notice that there are two parts to that qualifier: it’s not just about the company making you a great offer, you also need to feel good about what the team is doing and the value you’d bring. If both criteria are met, going back and trying to negotiate for more or turning the opportunity down because Google counters with more money doesn’t reflect well on you. Of course, at the end of the day, it’s your career and you choose how to handle the situation. But generally, this would be a scenario that warrants accepting the offer without negotiation. 1. When you have no intention of accepting. This might seem like a no-brainer, but many people think they can use a job offer as leverage to get a raise, even though there’s no chance they would ever actually accept the offer presented to them. This is, as they say, playing with fire. As discussed in the next section, not every manager will be able to separate the business from the personal when you present an offer and may take offense to the fact that you interviewed elsewhere. Or maybe your HR team has a strict policy against counter-offers that you didn’t know about. That’s why – no matter how good of a relationship you have with your boss – you need to be prepared to leave your current job if you bring an offer to the table for negotiations. If you have no intentions of ever accepting, decline the job and don’t risk negotiating. 2. When the comp plan is lower than your current one (and they know it). Recruiters might try to sell you on the idea of “taking a small step backward to make a big leap forward,” but generally speaking, that doesn’t pan out as advertised. That’s because your initial offer will be tied to a market rate for your role, but raises will always be on a set scale. For example, you might accept a position that pays 10 percent less than your current role because there’s promise of promotion within the first six months to a year. But that promotion only yields a raise of 8 percent, so effectively you’ve taken a 2 percent pay cut to take on more responsibility. Of course, you can try to negotiate here, particularly if the company didn’t know your comp plan ahead of time. But don’t get bogged down in negotiations with a company that low balls you when you love your current job – it’s not worth the headache and chances are, you won’t be happy there in the long run. So now you know when to accept and when to decline, but what about when things aren’t so cut-and-dry? What about scenarios where you want to keep your current job, but the offer is too good to turn down? Be sure you know your worth. Never enter salary negotiations with a hunch that you’re underpaid. 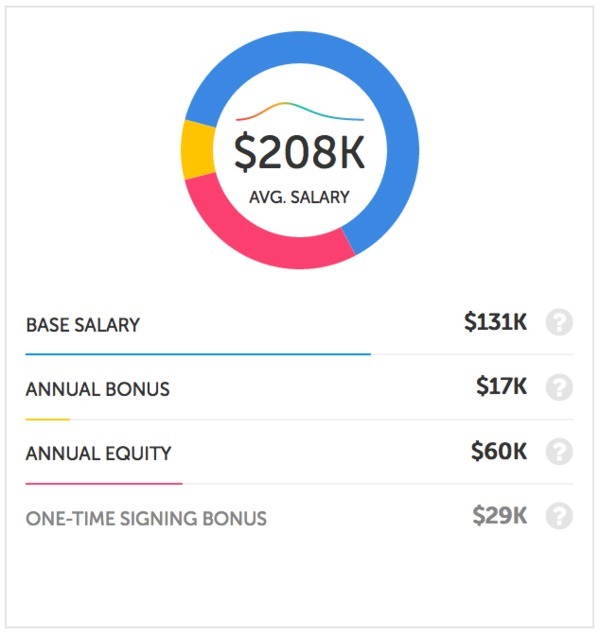 Paysa has salary data for thousands of roles at tech companies around the globe – research your current salary in comparison to roles at similar-sized companies and print out data directly from Paysa to use as leverage in your presentation. 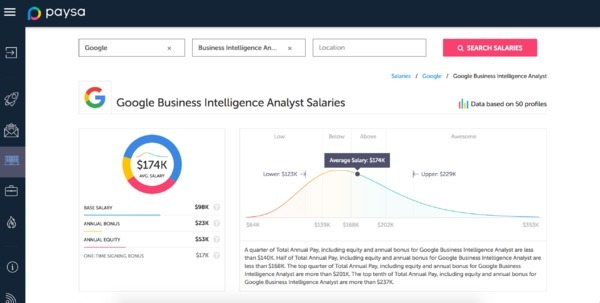 A sample Paysa salary page for a business intelligence analyst at Google. Look for historical precedent. Has anyone on your team or in your division successfully negotiated a pay raise from an outside offer? If the answer is “yes,” were they more or less tenured than you? That can give you some scope on whether it may be achievable. If not, ask yourself: do I really want to be the one to test the waters on this? Present the case to your manager. Try presenting your case without mentioning the pending offer first. You can only play the offer card one time and once it’s played, you’re liable for the outcome. That includes whatever happens if your boss reacts poorly. Present your case confidently without the threat of leaving as a first attempt. If needed, play the offer card. If it’s clear your manager won’t be able to bring your salary up to the expected industry standard, now’s the time to let your manager know you have a pending offer that does meet your requirements. It’s important to remain professional and never come across as threatening – instead be clear and tell your boss you’d much prefer to stay with your current company than go elsewhere, but you know your value in the job market and need to be making a competitive salary. Again, it’s important you’re prepared for any outcome here. It’s possible your manager tells you to accept the offer, in which case, you’re now in a difficult position if you’re not actually interested in the job. It’s also possible that your manager makes a promise to put you on a different career track to help you get to that compensation range within the next year or so. At that point, you need to decide whether it’s worth it to lose the opportunity in front of you on the promise of future growth. No matter what direction you decide to go, Paysa is here to help. Not only can you find potential opportunities on Paysa, but you can research salary data and even evaluate an offer to see how it compares to similar roles at other companies in your market. Visit Paysa.com today to get started.